Hawai‘i Senate Bill 3090 SD2 passed the Hawai‘i Senate in favor with a vote of 25–0 today, Tuesday, March 6, 2018, and now moves over to the Hawai‘i House of Representatives. Establishes the Maunakea Management Authority. Limits the number of telescopes that may be authorized on Maunakea. Authorizes the renegotiation of leases, subleases, easements, permits, and licenses pertaining to Maunakea. Requires that revenue derived from activities on Maunakea be shared with the Office of Hawaiian Affairs. Excludes Maunakea lands from the definition of “public lands.” Provides for free access to Maunakea for traditional cultural purposes. Establishes police powers and provides for enforcement of laws on land under the jurisdiction of the Maunakea Management Authority. Appropriates funds. Effective 12/31/2033. A statewide series of community presentations about the future of Maunakea begins tonight from 6:30 to 9 p.m. in Nānākuli at Ka Waihona O Ka Na‘auo, 89-195 Farrington Highway. A meeting has been scheduled for the Big Island in Hilo with Sens. 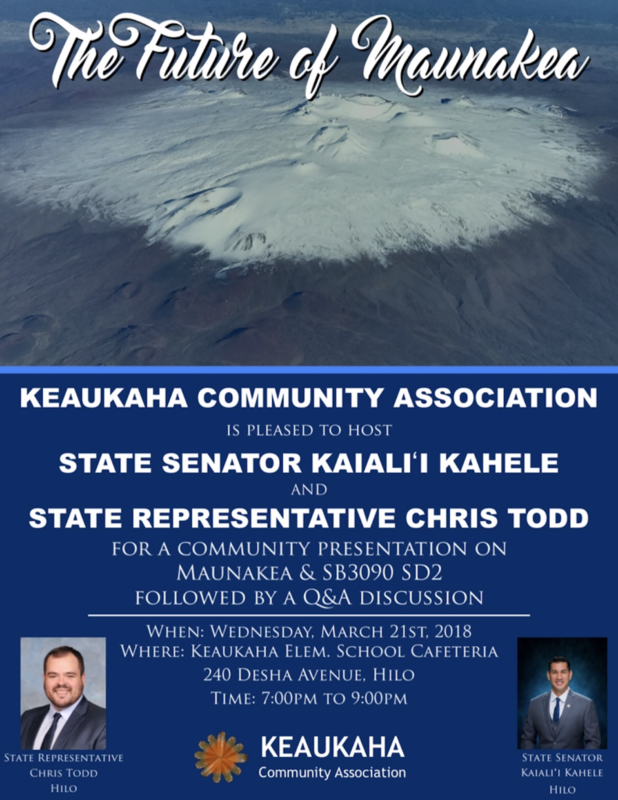 Kahele and and Rep. Chris Todd at Keaukaha Elementary School on Wednesday, March 21, 2018 from 7 to 9 p.m.